It’s time for the U.S. government to rethink the basic premise underlying commercial remote sensing regulation. This op-ed was published as the My Take column in the Aug. 29 issue of SpaceNews Magazine. Sixteen years ago, U.S. President Bill Clinton changed U.S. policy to stop intentionally degrading GPS signals for civil users. Previously, civilian GPS could be off by as much as a football field. Today, precision GPS enables a measurable part of U.S. gross domestic product and is a shining example of U.S. technological leadership; a world without a U.S.-provided GPS is hard to imagine. The United States is at a similar crossroads today with commercial satellite imagery. Satellite imagery began as a government domain. But the 1992 U.S. Land Remote Sensing Policy Act enabled American firms to operate imaging satellites, and I founded DigitalGlobe. In 1992, there were no smartphones, people thought the Internet was a fad, and high-quality satellite imagery was secret, or, at best, a government monopoly. The world has changed dramatically in the quarter century since then. Today, GPS and commercial satellite imagery underpin our location-enabled lives. Commercial satellite imagery powers our online maps and apps, is shareable with U.S. and coalition troops and first responders, and enhances global transparency. It exposes human rights abuses, highlighted by this year’s Pulitzer Prize for Public Service going to the Associated Press. 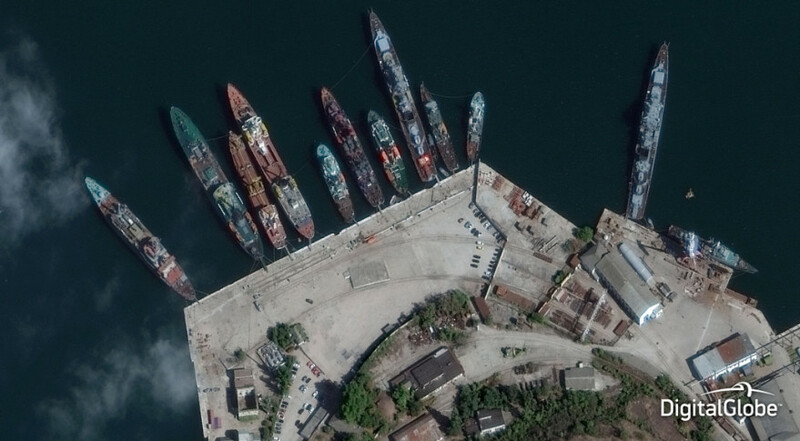 Their investigation used DigitalGlobe imagery to catch an illegal fishing operation in the act and led to the release of more than 2,000 slaves. While the 1992 act spoke of assuring U.S. leadership, the practice has been the opposite. U.S. restrictions on commercial radar imaging satellites ceded the market to Canadian, German, and Italian firms. DigitalGlobe’s 1999 request to sell 0.25-meter resolution satellite imagery was only granted in 2014, despite the availability of much sharper imagery from aircraft, and only due to the leadership of a handful of forward-thinking U.S. government officials, including Commerce Secretary Penny Pritzker. But DigitalGlobe’s request to allow sales of its native-resolution shortwave infrared (SWIR) imagery has languished more than three years. And U.S. firms must wait months for government approval to enter into large foreign imagery sales agreements, creating a competitive disadvantage. This regulatory dysfunction played out again a few months ago as wild fires burned in Canada. DigitalGlobe supported the Alberta Provincial Government with SWIR imagery that penetrated the heavy smoke, showing where the fires were actually burning. Current restrictions required DigitalGlobe to degrade the SWIR resolution, effectively throwing out 75 percent of the data and needlessly reducing the firefighters’ decision-making confidence. It’s time for the U.S. government to rethink the basic premise underlying commercial remote sensing regulation. Instead of focusing solely on the risks, acknowledge the benefits that widely available U.S. commercial satellite imagery bring to national competitiveness. Acknowledge that commercially available satellite imagery has proven to be a great social benefit. Acknowledge that the U.S. space technology edge has eroded, and satellite imagery is now available from dozens of countries. Acknowledge that the feared dire risks from the commercial availability of satellite imagery never materialized. Acknowledge that U.S. industry has been very forward-leaning in protecting national security through self-policing. Acknowledge that the world has changed. Two common sense changes are needed. First, stop the practice whereby any official within the U.S. government can block a license from being issued for an innovative technical capability. Just as the law requires a cabinet-level decision to impose shutter control — a capability that I agree should remain available to the U.S. government to use in time of crisis — license approval should be automatic and on a firm timeline unless a cabinet-level decision blocks it. Second, eliminate the need for approvals of foreign imagery sales agreements; the law doesn’t actually require approval, merely notification. The 1992 act is sufficiently broad that the White House could implement these changes with an executive order, as it did for GPS. Reforming the regulations is another avenue. If these paths cannot yield prompt reform, Congress should revise the 1992 act to eliminate its ambiguity and embody the principles outlined above. It’s time to finish what President Clinton started when he opened up GPS, by unleashing the complementary power of the U.S. commercial remote sensing industry to realize its full potential. Walter Scott is the founder, executive vice president and chief technical officer of DigitalGlobe.